WASHINGTON, D.C. — Much of the debate about democracy in Africa focuses on the foreign, mostly Western origins of the concept and how it shapes Western, including American policies toward the continent, according to African and U.S. scholars. Little attention has been given to the concept’s African roots as well as the experiences, governance practices and traditions of African precolonial states and how these shape contemporary African political thought. African high-ranking civilian and military officials attending the 16th Senior Leaders Seminar (SLS) hosted by the Africa Center for Strategic Studies (ACSS) in Washington, D.C., probed the application of the concept of democracy in Africa as it relates to the peace and security agenda on the continent. Dr. Houngnikpo is the Security Sector Reform Advisor to the Secretary of the National Security Council of Cote d’Ivoire. 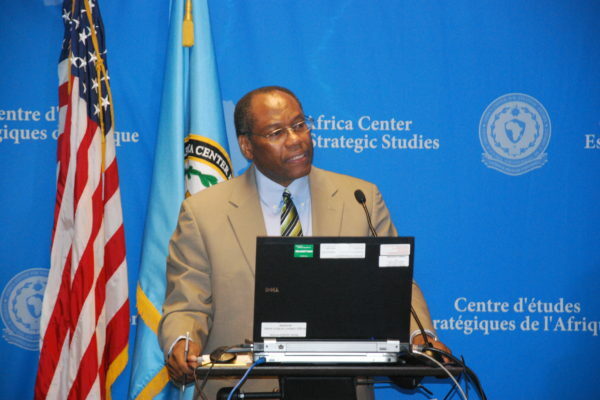 Until July 2013, he was the Academic Chair of Civil-Military Relations at the Africa Center. He encouraged participants to consider integrating the African precolonial experience in democracy and the positive elements of the post-colonial experience into a comprehensive and constitutive context that increases greater ownership by Africans of their experiences in fostering democracy. Dr. Houngnikpo told participants about some of the great African inventions, including the pyramids of Egypt and Northern Sudan, which predate the Arab invasions of North Africa in the 6th century BC. Dr. Houngnikpo discussed the progress that Africa is making in instilling greater democracy. He said that the era of single-party rule is mostly over, growing tolerance of political opposition is starting to take root, civil societies have become increasingly active, elections are being held more regularly, political participation is increasing, and security and defense forces are becoming more professional. He also highlighted ongoing challenges. Dr. Houngnikpo faulted the broader sociopolitical conditions and personalized leadership for election-related violence. “You have a situation where the capture of state power is synonymous with creating personal wealth, a problem that is made worse by the high levels of poverty and lack of delivery of basic services. … This results in a very high propensity for violence with all its negative effects,” he cautioned. African leaders were urged to pay closer attention to four core issues: 1) Greater efforts to integrate and learn from the precolonial African principles; 2) establishing a new social contract between leaders and citizens; 3) creating a culture that demands more accountability; 4) a paradigm shift in the way state affairs are handled. 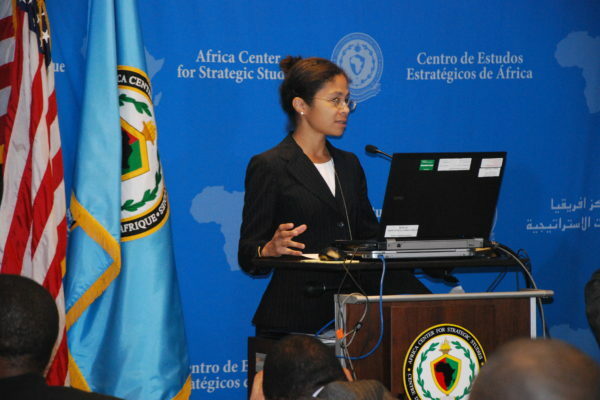 Dr. Dorina Bekoe, a member of the Africa Center’s adjunct faculty specializing in Africa’s security challenges, conflict prevention, and civil-military issues, discussed Africa’s electoral challenges. She decried the persistence of election-related violence, the persistence of military coups, and the negative uses of technology to influence elections through misinformation and in some cases intimidation. Citing data from a several polling sources, Dr. Bekoe noted that only 42 percent of the 286 general and parliamentary elections that have been held in Africa between 1990 and 2013 were nonviolent. The remaining 58 percent were characterized by varying degrees of violence, a statistic that Dr. Bekoe viewed as indicative of the conflict-prone nature of the African state in general. Despite these challenges some positive models are emerging. In particular, Dr. Bekoe discussed the Electoral Violence Observers Program in Ghana; the Network of Citizen Observers in Senegal; the District Code of Conduct Monitoring Committees in Sierra Leone; and the Multi-Party Liaison Committees in Malawi. She also gave examples of how technologies were be employed to: 1) Improve the voter registration process; 2) Create greater transparency in the transmittal and validation of results; and 3) Support early warning to prevent or respond to electoral violence. Dr. Bekoe urged senior African policy makers to invest in more holistic approaches to conflict resolution and to focus conflict prevention efforts on the pre-election period as indicators of violence are more visible during this phase in the electoral process. With the two-week seminar running through June 20, the senior leaders, representing more than 30 African nations, planned to continue discussing the fundamentals of security and strategy in Africa, core areas in security studies and current critical issues.